Each year, as Christmas approaches, shopping malls around the country begin to advertise live reindeer parades and shows. While attending these events may be innocent holiday fun for shoppers — the reindeer that are forced to perform have a very different experience. Reindeer, typically found in huge herds in icy Arctic temperatures, are often isolated and confined to tiny holding areas under unnatural, glaring lights, surrounded by people and noise for days on end. Most don't get to enjoy anything close to a natural habitat for any part of the time that they are subjected to captivity. Reindeer are social animals that should naturally live in huge herds in the cold temperatures of their Arctic and Subarctic habitats. Their welfare can be severely compromised when kept in the stressful conditions of a busy mall. That's why I was shocked when I saw Westfield Shopping Centers all across the country still advertising captive reindeer experiences as part of their holiday celebrations. Westfield Corporation is one of the biggest global retail companies, owning and operating over 40 shopping centers across the US. If we all speak out and convince them to stop, it could be HUGE for protecting reindeer and other animals from future inhumane treatment. 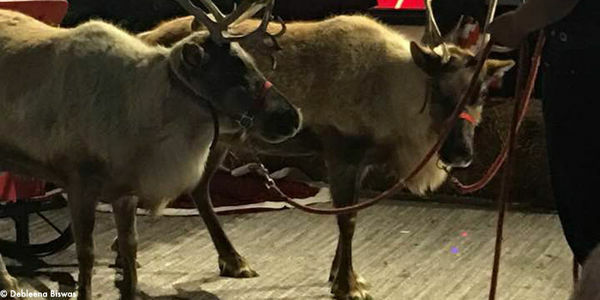 The Captive Animal Protection Society (CAPS) have reported that many reindeer used for Christmas events have died from "poor management and their special dietary and environmental requirements." The group also discourages families from attending any of these events since children seeing animals used as entertainment can promote damaging messages that animals are nothing but "living props." Christmas is a magical enough time for families without needing to exploit reindeer and other animals for a quick photo opp. Reindeer don't belong in a mall. Join me in calling on Westfield Corporation to stop including live reindeer in their shopping mall Christmas events. As a Care2 member who is concerned about the welfare of all animals, including reindeer, I urge you to immediately stop promoting live reindeer at Christmas events at any of your shopping malls. I also urge you take a stand for animals and publicly state you will not host any live animal displays or events in the future.